"This case was extremely regrettable. I would like to deeply apologise," said Narita International Airport's customs head Manpei Tanaka. The customs officer conducted the test on a passenger's bag against regulations. Normally a training suitcase is used. 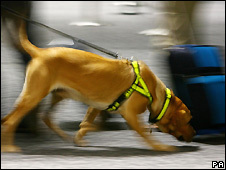 "I knew that using passengers' bags is prohibited, but I did it because I wanted to improve the sniffer dog's ability," the officer was quoted as saying. "The dogs have always been able to find it before... I became overconfident that it would work," he said. Japan has strict laws against drugs and possession of small amounts of cannabis can lead to a prison sentence.